Banning of "Assault Weapons": support or or against? View Poll Results: Banning of Assault Weapons? Re: Banning of "Assault Weapons": support or or against? Btw, while researching that same story I found this one where it very briefly mentions "a mother (that) used a .38 revolver against an intruder." Different intruder of course. However, I doubt her intruder could have been that much more benign than someone who robs houses with a child. She seemed to do just fine with a .38 revolver. So, in this example I just don't see how there was any benefit of an assault weapon over a non assault weapon. All I see is a possible lower degree of safety. 1) The AR-15 is not an assault rifle. It's a semi-automatic...meaning you have to pull the trigger once for each bullet (vs automatic...which is what actual assault rifles are). 2) AR-15's are easier to control and fire than handguns. Thus, using an AR-15 has a higher degree of safety, not lower. 3) A shotgun (which is also commonly used for home self-defense due to its power in close quarters combat) and many handguns carry a significantly higher chance of collateral damage and risk. Compared to these weapons, the AR-15 has a significantly higher degree of safety, not lower. I had to read this bit again. You make it seem like all assault weapons are equitable. They are over-powered and as such, unnecessarily dangerous...which using your words, may result in a high increase in collateral damage. OK...so that's the objection. I understand it, and can agree with it. But the AR-15 is not in the same category as the popular notion of what we think of when we say "assault rifle." The AR-15 uses a .22 caliber round. It isn't going to go through someone to result in collateral damage. It looks deadly...it looks like a military grade weapon...but it isn't. Lower powered guns are made to look like the "real thing" (the M16, their more powerful counter-parts) because people like the idea of it looking that way (sort of like a mod kit on low end cars make them look like suped up exotics). AR...does not mean "assault rifle." They are the initials of the company that created the rifle in the 60's (ArmaLite). It isn't an automatic weapon, it's a single-shot per pull. Many handguns and all shotguns are more powerful than the AR-15 (thus the increased odds in collateral damage). AR-15's are NOT assault rifles. That's propaganda from politicians. I know of no law enforcement agency, military, self-defense agency, etc... that would consider the US civilian AR-15 to be an "assault rifle." That's just fear mongering and playing on the ignorance of people when politicians say that it is. So if your position is that guns which cause a high increase of collateral damage...you are objecting to the wrong weapon. You ought to be objecting to most handguns and all shotguns, not the AR-15. Also, deaths from AR-15's are extremely rare. Handguns account for the majority of murders (6009 in 2010), rifles were involved in a mere 359 murders in 2010, AR-15's were below 20. Is it not more reasonable...to actually target the biggest problem maker? If it is the case that we don't want to see murders...and we believe that taking away the tool used in murders is the solution...then logically, you'd have to support taking away handguns. If we abandon logic, and say "Well...we have no reasoning here, but we'll just focus on rifles instead of handguns" ok...well...again, it's bad reasoning, but it's something we can consider I suppose. But what is happening is that the abandonment of reason is going off the deep end here and saying "We need to ban the LEAST of the contributors to the problem...AR-15 instead of tackling the largest contributor(s). That way...the problem will be solved. Addressing .02% of the problem will be much more effective that addressing 95% of the problem." And that...Libre...is why many gun rights advocates "stick to their guns" on the issue...the politically left don't seem to use good reasoning nor use facts. They allow hype, lack of knowledge on the issue, ignoring of the facts, propaganda, and the media to be the foundation for their position. And this just doesn't seem to be a very compelling position for those exercising reason. It's great for a bandwagon effect...governments have been using these strategies for thousands of years. In modern times, Hitler was a master of such manipulation and deceit. But he, like many on the left arguing about this issue, simply do not have facts or reason on their side it seems. Okay, if one argues that this is not an assault weapon then all that means is that the example supports my position even more. Since it would be a non assault weapon stopping an intrusion with little trouble. It would show that an assault weapon was not needed. Heck, it would show how a non assault weapon was probably even way overkill for this particular incident. Bottom line, no matter how you look at the example it seems to support my position more than the other. OK, so we are making some progress here. 1) It is NOT your position that all guns ought to be banned. 2) It is NOT necessarily your position that semi-automatic weapons (such as the AR-15) be banned. 3) It IS your position that guns that have a high risk of collateral damage and/or are unnecessarily dangerous, ought to be banned (and even then, only in densely populated places). Also, if you agree that the AR-15 is not an assault rifle, then MT's entering as evidence the story of the boy defending his home with an AR-15 is irrelevant because an assault rifle was not used. Last edited by Apokalupsis; May 25th, 2013 at 11:57 AM. Also, MT's entering as evidence the story of the boy defending his home with an AR-15 is irrelevant because an assault rifle was not used. I wouldn't necessarily say the AR-15 doesn't fall into the category of an assault weapon. I think that would depend on a person's definition of an assault weapon. All I'm saying is that for the purpose of the example presented there is no point in me presenting a position one way or the other since both positions would support me. I only addressed it from the angle of it being an assault weapon because it was being presented as such. I seen no point in arguing whether it was or wasn't... since I could easily show that even if it is it still supports my position. Bottom line, there are going to be weapons that are somewhere in between being a definite assault weapon and a definite non assault weapon. For the purpose of this debate I see nothing productive coming out of addressing the in between ones. Since discussion on them only makes things easier to be taken out of context. And we have seen how taking people out of context apparently is acceptable on these boards. So, I think it is best not to bait someone into doing it. All that would probably result is one long highly misdirected sidetrack that goes nowhere. I would rather stay on point. Now don't get me wrong, I completely understand that if I was actually implementing restrictions then I of course would have to better define what should or shouldn't be considered an assault weapon. However, at this stage we are only debating if ANY assault weapons should be banned. Now, if those currently opposed were to say they agree that some should be banned... THEN we could start narrowing down the criteria a bit. Until that happens all narrowing down the criteria too much does is fog the issue imo. I wouldn't necessarily say the AR-15 doesn't fall into the category of an assault weapon. I think that would depend on a person's definition of an assault weapon. Are laws created based on fact and/or consensus of facts? Or are they created based on arbitrary, subjective opinions? If the former, then the idea that it depends on a "personal definition" of "assault weapon" is erroneous. If the latter, then a spoon could be an assault weapon. All I'm saying is that for the purpose of the example presented there is no point in me presenting a position one way or the other since both positions would support me. I only addressed it from the angle of it being an assault weapon because it was being presented as such. I seen no point in arguing whether it was or wasn't... since I could easily show that even if it is it still supports my position. How can this be true? Since it is the case that the AR-15 is safer than a handgun and has less chance to create collateral damage, it makes no sense to say that it helps your course. Furthermore, if your position is that assault weapons ought to be banned, then it is the case that the term "assault weapons" need to be defined. A spoon...is not an assault weapon (even if someone is assaulted by one). Bottom line, there are going to be weapons that are somewhere in between being a definite assault weapon and a definite non assault weapon. What is a "definite assault weapon" and a "definite non-assault weapon"? Who determines what these terms mean? And we have seen how taking people out of context apparently is acceptable on these boards. No, we haven't. You are misunderstanding the occurrences it seems. Just because someone does it, doesn't mean it is "acceptable" (in the sense that it is encouraged or that it isn't correctable). Now don't get me wrong, I completely understand that if I was actually implementing restrictions then I of course would have to better define what should or shouldn't be considered an assault weapon. However, at this stage we are only debating if ANY assault weapons should be banned. 2) have no working, objective definition of "assault weapon"
All you are saying here is that "I only want to talk about whether or not we should allow race cars on public streets. By the way, I don't want to have a discussion about what constitutes a race car." It makes no sense. You can't give a value judgment to something that you haven't defined. Would you say that as a whole, people should aflapapharm one another? Nevermind defining that term. Should we or should we not do that to one another? That's all we are discussing here. Obviously, such a position is nonsensical. You, I, MT, nor anyone else can place a value judgment on something that we aren't defining or understanding. Before you can defend or attack an idea or concept...you actually have to know what the idea or concept is. I agree with your position overall. But it is important to dial in to the issue accurately. Libre's position is that "Although there is SOME good that comes from having such a weapon, the bad OUTWEIGHS the good." It's an issue of "greater good" then. Also, and mind you, I'm not arguing the anti-gun position here...just taking issue with less than accurate reasoning as I personally see it....it is NOT the case that if assault weapons were banned...then we'd have an instance of NO guns for the boy to defend his home with. It is simply the case that the boy would have a DIFFERENT gun, a handgun for example, to do so. Well, we have to consider the good in order to even say that though. That is one of my points. No, your making a very fair point. .it is NOT the case that if assault weapons were banned...then we'd have an instance of NO guns for the boy to defend his home with. It is simply the case that the boy would have a DIFFERENT gun, a handgun for example, to do so. I don't think that is a very safe assumption. For several reasons. 1) Not all guns are made equal, nor are they all equally effective for a child to handle. 2) It isn't necessarily the case that removing one gun would automatically be replaced with another kind because purchasing a gun to begin with can have very complex reasoning that would prevent it. b) A person who wants a weapon his child can use is not going to replace a ar-15 with a handgun. Both of these points rests on the differing qualities of the guns. c) The gun advocate I am, I may not own a hand gun if it were not for the fact that I "love" the 1911 that I purchased. Purchases are not only utility in nature (like buying napkins or toilet paper where just anything will do). The point is, it is a very real possibility that in that instance a ban on assault rifles (when defined to include an ar-15) would have kept a gun at all out of that situation. A gunshot by the right handgun (which would replace the hypothetically banned AR-15), would have had the same effect: the robbers leaving the home. This is true, and there are statistics that show ANY gunshot will do. That said, it isn't a given that he would have hit the intruder with a handgun, as they are not really a fair comparison. A rifle is much easier to use. 1) Libre isn't arguing that it would be better for the boy to be unarmed vs 2 intruders. 2) It is a case of greater good. 3) If AR-15's were banned, this doesn't prevent gun rights advocates from owning and using other forms of guns to defend themselves. 4) The boy trained in handguns as he was w/ the rifle, would produce the same result (intruders want a quick in and out...not a gunfight). 1) If we are going to discuss the good vs evil of any particular gun or class of them, it should be fair game to give the gun/class used the credit for the good that it does. I mean, it seems to be a special pleading fallacy to say that the school shooting using an AR-15 was bad and evidence against it's use, but then to deny the admission of a boy using an Ar-15 to defend himself as evidence. 2) While it isn't his point that no guns would be available, it is a very real possibility that taking a specific kind of gun would in fact remove a gun at all from THAT specific situation. That said, I looked at your link and seen nothing in that story that couldn't have been accomplished with a non assault weapon. Those thieves were just that... thieves. According to the story they were just known for breaking into homes and taking stuff. There was absolutely no indication they were armed or violent. No mention of them firing back or anything like that. So, exactly why was the extra firepower needed? I just don't see it. How about ease of use and handling? Sure, it might make the neighbors feel extra special inside that a possible excessive force was used against the criminals... but did they stop to think about where all the other bullets went? From the sounds of it the kid unloaded on the criminals. Are we assuming he only shot 2 or 3 bullets from an assault weapon? Maybe... but does that really sound likely? It's possible to miss with a handgun also but most handguns aren't going to turn your neighbor's house into Swiss cheese. Why would you say that a 9mm hand gun round will go through a car door. By the way, one of the two intruders the kid was firing at was a child. The other guy was an adult though. However, he was robbing places with a child. And they apparently have no violent history. Do these really sound like hardened criminals that you need an assault weapon to defend against? Irrelevant. It is not the job of the one being attacked to rule out every possible scenario. If the child was in danger of being shot, it wasn't the fault of the person being attacked.. it was the fault of the Adult who decided to take him along during a crime. Bottom line, I see nothing in this story that couldn't have been accomplished using a non assault weapon. All I see is a possible high increase in collateral damage. So, if anything I think this story supports my position. 1) Hand guns offer the same problem that the Ar-15 does as far as danger to neighbors. Because it is an inherent danger to any projectile fired from any gun. 2) On the scale of bullets the .223 is not very powerful and if the child had instead held a common dear rifle the danger would have been even greater. So, you use special pleading to say that it would effect the negative use, but not the positive use in the same way. I have to correct you here. 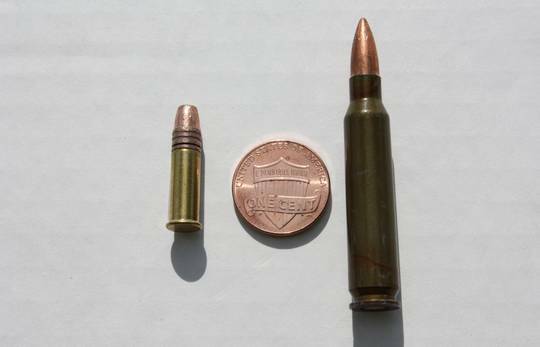 The AR-15 uses a .223 round, which is the same round the military uses in it's weapons. As opposed to a.22 round. The Ar-10 uses .308 round which is the same round as the Ak-47 (the other popular military gun). The only difference is that the civilian Ar-15/AR-10 are not fully automatic and do not have a 3rnd burst setting. The Sandy Hook shooter used an AR-15, and it is commonly called an "assault weapon". Also, it is the AR-15 frame that is commonly modified so as to fall into defined "assault weapon" category. IE Pistol grip, accepts a clip Etc..
Ah.. I see. I was using "assault rifle" as the politicians do. I actually don't think there is an official such thing as "assault rifle". It is a purely political definition. I can't remember if it was squatch are Talthas that addressed the political designation of "assault weapon". I know talthas did in post 34. Libre, can you please define "assault weapon" and list some examples. First off, I'm getting a little annoyed with your ignoring my posts when they directly rebut points you are continuing to assert as if I never posted anything. If you're going to make assertions, be prepared to defend them if they are challenged, or at the very least stop bringing them up if you don't care to defend them. Simply pretending that I didn't raise an objection doesn't make your point any more valid. Actually, neither angle supports your position, since you haven't shown any increase in the likelihood of safety or a decrease in the incidence of accidents in cases where rifles of *any* kind have been banned... let alone "assault weapons," which you have consistently refused to provide a definition for despite being asked by 3 different people. The only definition you've offered, in fact, disqualifies the vast majority of long arms sold and used in America, and you have not addressed this point, either. Until you tell us what standards you propose should be used to define "assault weapons," it's meaningless to continue discussing the subject at all. Since discussion on them only makes things easier to be taken out of context. And we have seen how taking people out of context apparently is acceptable on these boards. Please name a specific example of someone taking an argument you have made regarding this debate out of context and clarify the statement in an unambiguous way to provide the proper context. Also, please address the several other objections I have raised to your points, which you continue to assert despite my rebuttals. All I am saying is that we aren't currently debating at what point a weapon becomes an assault weapon. We are debating if any assault weapons can be too unsafe. Or at least that is what I'm debating. We are debating a few side issues that go along with that also but basically that is the topic I'm debating. Thus, it just makes sense that when presenting examples we would FIRST use a weapon we can all agree is an assault weapon. That way, if I prove my case then the other side can't claim that the example presented wasn't really an assault weapon. Or, if they prove their case I can't claim the same thing. It just seems logical. Now, if I prove my case and the other side agrees with me... THEN we can start narrowing down at what point my case would no longer hold true. However, trying to start at that point is idiotic since we would have no agreed on starting basis to judge it by. We could go 6 months debating it and never even have a consensus on whether that weapon was even an assault weapon to begin with. We would be nowhere. In other words, we shouldn't put the cart before the horse. The example was presented as a positive result from the use of the weapon. Or at least that is how I understood it was being presented. * If we decide to call it a non assault weapon: It 100% backs my position because it shows how a non assault weapon can not only meet the intended need but was probably even overkill for this particular example. * If we decide to call it an assault weapon: It still supports me. Because there is nothing presented in the story that even comes close to indicating that a non assault weapon (one of lesser lethality, etc) wouldn't have accomplished the same purpose. There was no indication that these thieves were violent or even armed. One was even a child. From looking at the story it wouldn't surprise me if these kids would have been protected simply by yelling. There is absolutely nothing presented in the story that indicates to me that these thieves were out to hurt, kidnap, etc. By no means am I saying the kids were wrong for shooting. How could they know who was breaking in? What I'm saying is that as it turns out it might not have been necessary to shoot once... let alone multiple times. Thus, from the info presented in the story I see nothing to indicate a normal non assault weapon wouldn't have worked just as well. Therefore, I see no need to go into some long sidetrack on this particular weapon. In the end it wouldn't matter what the result was in regards to this example. It supports my position either way. I completely get the instinct to look at this example and go, "Oh my, those could have been murderers breaking in." However, it turned out they weren't. Thus, it can't be presented as such. It was just a child and an adult thief... who had no violent record. IMO they would have probably been scared off by about anything. An assault weapon was not needed to do it. Yeah, I agree that it should to a certain degree. I've even already taken the first step in doing that by providing a generic definition of my own... probably not the best but I got something out there at least. And I invited someone else on the other side of the issue to provide a generic definition as well. Once we have that then we can look at both and find something that intersects both. And that would probably be a good weapon set to focus the debate around. Then once a conclusion is made... if ever... you take it a step further and try to refine the criteria. However, if we can't agree that ANY assault weapons are too dangerous then what is the point in defining at what point one becomes an assault weapon? I would agree with you if there were no weapons at all that either side could agree were assault weapons. However, I find that highly unlikely. I was qualified on the 9mm though in the military. I actually came close to getting marksman on it... even though I didn't get much practice on it. I was enlisted and usually only the officers and law enforcement types qualified on the 9mm. I often wore civilian clothes though while I was deployed... a 9mm was a little more appropriate for certain settings. I was still required to frequently qualify on the M-16. I always qualified but never got close to marksman on that weapon. And I certainly didn't find the M-16 to be easier to use than the 9mm. The 9mm you could go from holster to accurate fire in like 1 or 2 seconds. Plus, I never got a single jam on the 9mm. I got several on the M-16 almost every time I shot one. Granted, the M-16s were well used. This relates back to a comment you made about ease of use. My point is that even if you don't consider an M-16 an assault weapon I think we can at least agree it is closer to being one than a 9mm. And I just don't see how one could consider a 9mm harder to use in a close quarters situation like that then something like a M-16. If you think that is the case then I'm guessing you have never shot either weapon in close quarters. Or, you have shot both of them an insane amount of times to the point where you are beyond being an expert at them and thus both would be cake for you. However, we are talking about people owning these weapons that aren't even required to be trained on their proper use... let alone be experts. I wasn't asserting that you said "a 9mm will go through a car door". I was asking, why would you say "Sure, it might make the neighbors feel extra special inside that a possible excessive force was used against the criminals... but did they stop to think about where all the other bullets went? From the sounds of it the kid unloaded on the criminals. Are we assuming he only shot 2 or 3 bullets from an assault weapon? Maybe... but does that really sound likely? It's possible to miss with a handgun also but most handguns aren't going to turn your neighbor's house into Swiss cheese. "; Because a 9mm will go through a car door. In other words, that a 9mm will go through a car door, means that what you said doesn't follow. When it comes to a child using a weapon (such as my example), hand guns are more difficult to master. That they have the tactical advantages you point out are true, but you are comparing an adult use to a child use. This relates back to a comment you made about ease of use. My point is that even if you don't consider an M-16 an assault weapon I think we can at least agree it is closer to being one than a 9mm. And I just don't see how one could consider a 9mm harder to use in a close quarters situation like that then something like a M-16. I was speaking to proficiency. Not simply point and pull the trigger. That a rifle is easier to be proficient in, and hit what you are trying to hit. If you think that is the case then I'm guessing you have never shot either weapon in close quarters. Or, you have shot both of them an insane amount of times to the point where you are beyond being an expert at them and thus both would be cake for you. However, we are talking about people owning these weapons that aren't even required to be trained on their proper use... let alone be experts. I shoot with my family. My son has not shot my Ar-15, but has shot a .22 handgun. Where as my extended family (all young and ranging in age) shot my AR-15 and was able to hit the target the first time touching it. So I am speaking from experience. As for being an expert.. that is my point. A rifle is easier for someone with little to know experience to pick up and use effectively (IE hit their target) then an handgun. It isn't that people can't be as good or better with a handgun. only that on par it is clear which is easier. My point is that even if you don't consider an M-16 an assault weapon I think we can at least agree it is closer to being one than a 9mm. I wouldn't know.. I don't know what an "assault weapon" is ,in fact I don't believe they exist at all. ... would you mind telling me and giving me an example. finally, my example can not support your position because there was NO collateral damage. Your position is based on the idea of LESS collateral damage being caused. I don't think anyone is doubting that a vast majority of guns are deadly. Is it your claim that all assault weapons are no more dangerous than a 9mm? Is it your claim that the potential for collateral damage is not higher with any assault weapon? If you are not claiming that then I'm not following the point of your comment. Unless you are actually trying to provide support for my position... since according to you it sounds like a 9mm would be more than powerful enough to get the job done. All I am saying is that we aren't currently debating at what point a weapon becomes an assault weapon. We are debating if any assault weapons can be too unsafe. You cannot do that unless we know what an assault weapon is. Is a spoon an assault weapon? Is a Swiss Army Knife? Is a BB Gun? How about a pellet gun? Is a shotgun an assault weapon? Is a cat with very sharp claws? Is an M16 an assault weapon? How about a Magnum .357? Or a bazooka? Is an Apache helicopter an assault weapon? Without identifying the term "assault weapon" you, no I, can make absolutely no value judgments on the matter whatsoever. We need to build the foundation for that discussion of values. Without the foundation, it is impossible to discuss values. Impossible. This is a point that you are for some reason, not understanding. Or at least that is what I'm debating. We are debating a few side issues that go along with that also but basically that is the topic I'm debating. You cannot do any such thing without first determining what an assault weapon is. What makes an assault weapon dangerous in the first place? Is it the sharp claws? Is the the fact that it pierces skin? Is it the fact that it has the potential to kill? Can it do math really, really quickly and thus, "mind bending"? Is it because it is fuzzy? Thus, it just makes sense that when presenting examples we would FIRST use a weapon we can all agree is an assault weapon. Bingo! That is why it is necessary to define what an assault rifle is. That way, if I prove my case then the other side can't claim that the example presented wasn't really an assault weapon. It is not the case you need to put the weapon in the right category...it is the case that "assault weapons" needs to be defined. This should have been done in the OP. 100% of the time, when using terms that may not be universally accepted, we should clearly communicate the concepts we are meaning to refer to and discuss by defining necessary terms. If that is not done by the original argument maker, then it is important that subsequent arguments do so. But somewhere, it needs to be done. If not, then absolutely NO discussion about "assault weapons" will be meaningful (let alone, compelling). 1) We don't use hindsight as a means to decide on the here and now because hindsight does not exist in the here and now. 2) The story in question is a bad example because the AR-15 is NOT an assault weapon and it is safer than a handgun or shotgun; it also causes less collateral damage. 3) Given #3, your statement that it should not have been used was just as mistaken as MT for bringing it up in the first place (I acknowledge however, that he has defended doing so, but I'm ignoring that for the time being and only focusing on what you and I have discussed). The REASON you said this particular weapon should not have been used, was because of its high degree of risk and collateral damage. That...is a false statement. It's incorrect. It has a lower risk of danger and less collateral damage than almost any handgun or shotgun. Do you now acknowledge your statement now to be in error? This is important that we address this for it is the REASON you objected to the weapon being used. It being LABELED as an assault weapon or non-assault weapon is entirely irrelevant at this point. We aren't talking about assault weapons in this side argument...we are talking about your objection to the AR-15 being used in this situation. No. It being an assault weapon or not is ENTIRELY irrelevant to your objection of it. See above, point #3. However, if we can't agree that ANY assault weapons are too dangerous then what is the point in defining at what point one becomes an assault weapon? 1) What constitutes "assault weapon"? 2) Is X weapon in the category of "assault weapon" as defined above in #1? These are 2 distinct issues. Before you can even start to address the issue of "Should we ban assault weapons?" the category or classification of 'assault weapon' needs to be defined. You cannot answer the issue of banning UNTIL we know what it is we are discussing. We cannot determine the value of doing such a thing until we know what it is we are evaluating. You are seemingly putting the cart before the horse here...wanting to decide first if someone should aflapapharm someone else...before we even know what the heck aflapapharm even is. And that just doesn't make any sense. Is it your claim that all assault weapons are no more dangerous than a 9mm? Yes because 9mm exist, and assault weapons do not. Is it your claim that the potential for collateral damage is not higher with any assault weapon? Yes, because non-existent things can not cause collateral damage at all. Your point requires a distinction to exist.. none does. I withdraw and concede your point regarding the example until assault weapon is defined. You are correct that it isn't an assault weapon, as I hold that no such thing exists until some definition is given. I don't think I can agree with that for the example/comparison given. Yes, some rifles are easy to use. And yes, there are some hand guns that I wouldn't even want to try to use let alone expect a kid to use. However, we are talking about a 9mm as the handgun. It has very little recoil, holds plenty of bullets for a situation like this, is easy to reload, and is pretty darn accurate for a handgun. And as you pointed out it has more than enough power to get the job done. It feels almost like an extension of your hand. My first time shooting a handgun was the 9mm and that was in the military. I was given a clip to practice with. Then I was tested... and I not only qualified but almost got marksman. And I did just as well other qualifications. Plus, we aren't talking about a 8 year old or other small kid. We are talking about a 15 year old. If it was a very young kid then I could see there being an advantage of having a rifle of sorts... since it would help prevent the kid from accidently shooting themselves. However, imo an 8yo shouldn't be left home by themselves... let alone with a loaded weapon. Just my opinion. Bottom line, I just can't see an assault rifle being easier to use in a situation like this for a 15 year old. Even if you could convince me it was... I don't think you could ever convince me it would be a lot easier. Not enough to justify the extra potential for collateral damage. A 9mm and several other handguns are just not that hard to use. Is it your claim there is no such thing as an assault weapon? If so then I guess we are done. No point in continuing to debate if you aren't willing to accept the existence of what we are debating... lol. Is it your claim there is no such thing as an assault weapon? What... is.. an.... assault ..... weapon? I don't believe they exist, because you have refused to define what it is. No point in continuing to debate if you aren't willing to accept the existence of what we are debating... lol. you misunderstand.. the debate is over. you say assault weapons exist, I say they do not. Our positions have equal support, and cancel each other out. Unless you want to further the debate and actually offer support for your assertion (as all I have done was deny it), that is where debates of that sort end. It is really a low standard to even call it a "debate'. It's more like an opening statement with no support, rebutted with all that is necessary to rebut such a position. All your doing is making a string of claims based on an undefined term. You have no position to debate. but then.. instead of throwing up your hands.. why not just prove me wrong with a simple definition and example? I'll support MT. I've taught many people the basics of firearms and I can say without a shred of doubt that out of the 15 or so adults and older teens none of them shot pistols better than they shot rifles. None. I'd also like to clarify the rifle targets were at 50-100 yards varying from upright to bench rest; pistols for 10 yards. No one, and I mean no one was able to put more two rounds on target out of 30. Most were so low they hit ground. Put them under pressure and I doubt the results would improve. I've never EVER had anyone miss that bad with a rifle. My M1 Garand is easier to fire than most pistols. 1) Okay, let me try to explain again. There is no single accepted definition of what an assault weapon is. Therefore, the only way we can discuss the issue of this thread from a logical standpoint is to come to an agreement on a category or even a single weapon that both sides would feel falls into the category of an assault weapon. 2) THAT would be our benchmark. How do we do that? One way would be for one of us to provide an idea of what they think would encompass assault weapons (I have done that)... then the other side does it (I've asked the other side to do that... still waiting). We see where they intersect and that is our benchmark for the purpose of the discussion. 3) We then discus the actual topic of the thread. If we later come to an agreement that I'm correct THEN we start refining our definition of an assault weapon. We keep lowering the bar lower and lower until we run across a set of weapons we cannot agree falls within the position we at that point have agreed upon. That would then establish our new low end of the scale for our now agreed on definition of an assault weapon. At that point we might just agree to leave it at that. Or, if one of us feels it should still be lower then they would need to provide new arguments to support lowering it further. If you could please indicate which part you disagree with or are not understanding. Bottom line, all of this dancing around by people tells me that instead of wanting to try to debate the actual issue of the thread some might be trying to tie it up in red tape so we never actually get anywhere. The issue CAN be debated without a fully defined criteria of what an assault weapon is. All it takes is both sides agreeing on a single category... heck, a single weapon they consider to be an assault weapon. The only way it wouldn't be debatable would be if one side simply refused to accept that assault weapons exist at all. However, imo all that would do is forfeit their position... since this thread is about whether you support them or not. You can't say you support or are against assault weapons if you are claiming they don't exist. And that is the subject of this thread. So, if someone is in this thread their overall position would have to be support or against (or I guess in between). And you can't do either of those if you feel they don't exist at all. Thus, regardless of your position it would be forfeited by default imo. Well, I guess you could come in with the belief you don't think assault weapons exist and then try to completely change the purpose of the thread... but I think that would fall into the trolling category. Or come close too it... since you might be intentionally trying to derail the purpose of the thread. Not that I'm claiming anyone is doing that. I agree 100%. For the purposes of this discussion, both parties (pro and con) need to be on the same page and use the same concept. We are after all, discussing the merits of concepts...not words. I'm fine w/ this. I'll go back and see what you both said. But it seems like others are still asking for you to define it. Have you clearly done so? If so, which post #? 3) We then discus the actual topic of the thread. If we later come to an agreement that I'm correct THEN we start refining our definition of an assault weapon. I'm fine w/ this as well. I'm fine w/ all the above. We are talking close quarters though. And we are talking about possible obstacles such as doors/doorways, lamps, chairs, etc. But yeah, at 100 yards you would be an idiot to use a pistol...lol. Go find the largest room in your house. Stand on one side and look across to the farthest window. That is probably the maximum this 15 year old was from the people breaking in. In fact it was probably a lot less. My longest shot I could find was standing in my kitchen and looking through and across my living room... that was about 23 feet. However, the thieves tried to come in one of the back rooms. It was a one story house so the largest room there probably would have been the master bedroom. The longest window shot I could find in any of my bedrooms was 12 feet... but only if I stood out in the hall. Assuming they have bigger bedrooms than me... maybe around 15 feet. You could literally be blind and hit a window from 15 feet with a handgun. And yeah, I'm sure you could hit it just as easy with a rifle. However, that doesn't mean you needed the rifle to do it. It therefore comes down to which one would be easier to maneuver around the house with. Which one would require less thought to fire. Which one you could get to the ready fastest. Which one would allow for you to present the smallest profile to the intruders (in most situations in your house). And which one would reduce the odds of collateral damage if you missed, etc. The handgun comes out ahead imo hands down. Especially if we are talking about an assault rifle. 1) There is no single accepted definition of what an assault weapon is. An automatic or semiautomatic weapon that holds 30 or more rounds of ammunition and which is generally understood to fire one bullet each time the trigger is pulled. And then there's also the little, but somewhat significant issue that assault weapons are so rarely used in crimes (less than 1 percent). Last edited by eye4magic; May 25th, 2013 at 10:03 PM.